Quo Vadis? : OK Kanmani? OK,OK! 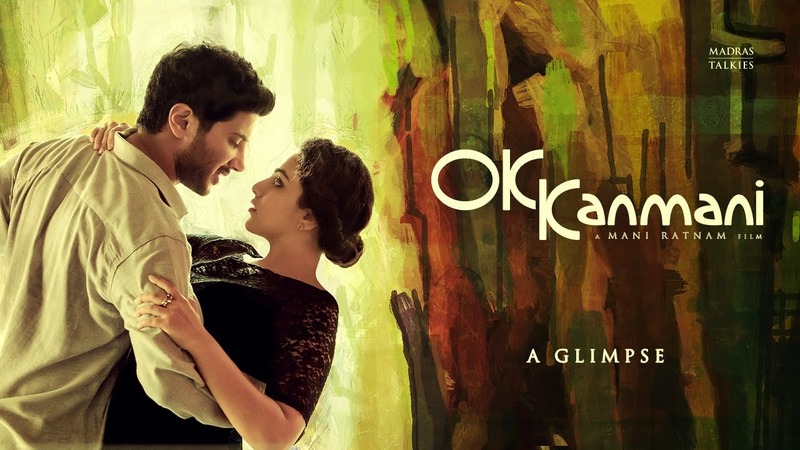 Dear Suhasini madam, I watched OK Kanmani and I do not have a qualification to review it since I am not from IIN, nevertheless I think I will still go ahead and give my views on the movie. You know it is a Mani Rathnam movie when you see the train and the station, the opening game sequence may have thrown a viewer off and make him / her sit forward in his / her seat in expectation of something radically new happening but then you see a railway station and a diesel engine chugging in to stop. The hero pops his head out from a compartment that usually in these kind of trains would be the unreserved one and packed to suffocation limits with passengers barely holding on; but since this a Mani Ratnam movie and since it is a hero entry, he (Dalquer) jumps off and pulls his luggage easily since nobody else gets off there. By now the viewer would have realized normal service has resumed and will sit back in his seat munching popcorn for some movie magic. The heroine entry is a little muddled and is a repeat of Alaipayuthe but you permit this referencing because the lead pair is quite good looking and you came in to the theatre to watch a Mani Ratnam movie and a train is probably his lucky charm. The hero and heroine introducing themselves in the promos on TV seemed cute when it went up to their names but then they pull out their mobile phones and go on to discuss a lot of nonsense shows how little people understand what goes on in a church. Again the marital vows seemed to be mixed up and I was not sure what exactly happened in that scene but the only saving grace was that AR Rahman played Here Comes the Bride at the bridal entry instead so at least they got that bit right. The introduction scene of boy & girl no matter how silly and how implausible it was just to highlight that the lead pair was not into marriage and so in a departure from Alaipayuthe, the wedding was not to be expected if at all only at the end. Then the song sequence, the brilliant song sequence of Dalquer & Nitya on the bullet that reminded you of Siddarth and Trisha in Ayutha Ezhuthu, actually both couples are the same; no commitment, no baggage, just have a good time. I mentioned that it was a brilliant sequence, this is because of some amazing photography by PC Sriram. Mumbai never looked so beautiful and inviting as it does when the two zip around on the bike with ARR Rahman singing Mental Manadhil. In between all this when you think that the movie is about the love story between Dalquer and Nitya or Adi and Tara as they are called you get to meet the owner of the house where Adi stays as a paying guest, Ganapthi and his wife Bhavani who suffers from Alzheimer’s and thereby has a memory loss problem. Ganapathi cares for his wife and then it strikes the viewers that hold on this is the love story, because the lead pair are too busy having a good time without any baggage. You will see many traces of Mani Rathnam brilliance at various places and referencing to other movies that will bring a smile to your face and the songs that seem unobtrusive though at times not needed keeps the good spirits going. The lead pair is very good looking and seem to be extremely comfortable with each other that it can be annoying that they do not fall in love. Since the premise of this movie is against the institution of marriage we see the couple end up in bed in a hostel. I am not too sure that hostels allow a visitor to a room, maybe they do but rooms and space seem to jar in this movie. We have Adi living in a large room in a large flat in Mumbai where a 0.5 BHK (yes you have that in Mumbai) would probably cost a fortune for a lay man especially a middle class man as he as Ganapathi are shown to be. Then we have the room in a lodge in Ahmedabad where Adi and Tara end up as they miss a train and after a lot of fooling around in a house sized room they end up in separate beds. And then there is the hostel room where they end up in the same bed. The talk afterwards Adi and Tara confirm that this arrangement works fine and marriage is a lot of trash. Adi getting the permission of Ganapathi for a live-in arrangement is genuinely funny and Tara clinches the deal by sweetly singing her way to Bhavani’s heart. The movie meanders its way through small twists and turns and you see two relationships, one that is about love and one that is not love well almost INR 1.50 I think (watch the scene to understand). By now the inevitable happens and you can see that the lead pair are slowly falling for each other and Tara’s expressions in these sequences are a treat to watch. The visit to the gynaecologist is another funny sequence but the best smiles were reserved for Bhavani, you feel a little when you laugh at the infirmity of someone but it’s a movie and this infirmity also has a role to play in the movie. By now you may be restless even annoyed when Adi and Tara take turns to deny that they have feelings, you know the feelings of love for each other and you are mentally egging them to take the next step. You think that it is about to happen in a sequence in a boat when Tara asks Adi to speak from his heart and he says that he would like to eat a bread omelette at that moment. You smile but also wonder what happens next in a moment of confusion and then the infirmity which I mentioned earlier surfaces again to take the movie to a climax. In a long drawn chaotic rain sequence Adi lets out that he wants to get married to Tara. The closing sequence is a beautiful marriage sequence which mercifully is a civil wedding and so had its own quirks but is nevertheless beautiful to see. So should you watch it? If you are a Mani Rathnam, AR Rahman and PC Sriram fan, it is a no brainer. If you like a light hearted rom com, you should go for it. If you like to watch breezy time pass movies do not miss it. After Kadal, which I hear has a lot of subtext and hidden meaning which I did not get and which I decided not to watch ever after when I saw the treatment of the song Nenjukulle this is a welcome return from Mani Ratnam. Nowhere close to his classics, but some magic still remains. You are definitely rocking with reviews, Clement. Wow! Suhasini should be honoured to read a review like yours. Nevertheless, I want to see this one. It is released here in Goa as well. PC and ARR are the greatest plus in this movie. Nicely reviewed Clement.